​After a rattling chickenbus, a rocking lancha boat and a bumpy tuktuk my mother and I finally arrived at our planned destination: Altagracia, Isla de Ometepe. Apparently these weren’t enough modes of transport, as we should have rented a motorbike as well. Why? Keep on reading. 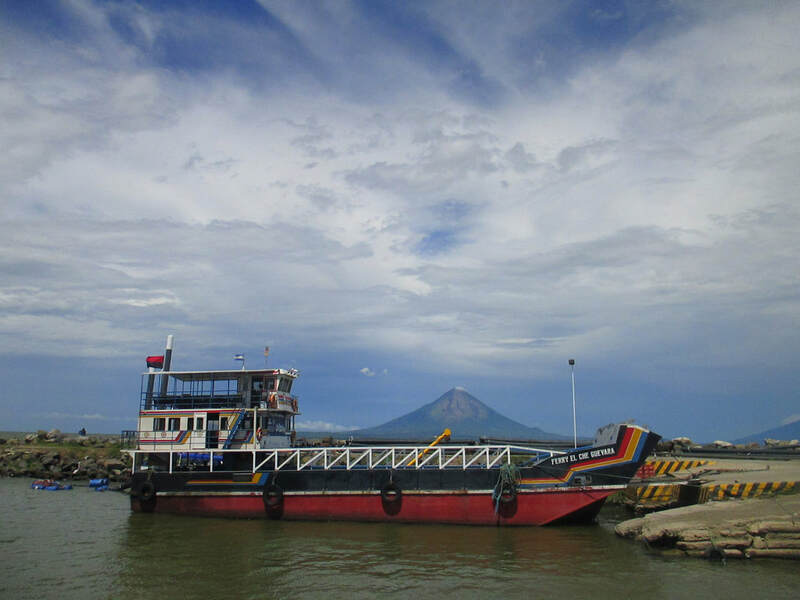 Isla de Ometepe has it all: beautiful nature, comfortable beaches all around facing the Cocibolca lake, tropical weather and two stunning volcanoes giving the island a truly unique shape of an hourglass. You can go climbing, biking, hiking, kayaking, swimming and kitesurfing. There are museums, there’s wildlife and you can take a massage if you feel like it. There’s just one crucial thing missing: Transport. Yes, from Moyogalpa, the flashy tourist hole dotted by travel agencies and shouting vendors, tours can be arranged. However, if you decide to elect some peace and quiet and opt for a stay in, let’s say, Altagracia... yeah, you’re f*cked. You can rent a motorbike (not in Altagracia of course, only in Moyogalpa or Santo Domingo), but as I was travelling with my 60-year old mum we decided not to, which equals deciding to waste your time. After a comfortable night in our sweet & cheap little bungalow we decided to go for a kayak tour in the river Istián between the two volcanoes… but after five people told us there was no bus going, four people that it was going and three people that they didn’t know, we decided to change our plans and head to the ‘Ojo de Agua’ instead. Great, how? There was no bus going related to some national festivities (yes, that was the excuse that day) and besides some bikes we didn’t see any cars. So we did what the locals do: Sit down and wait. We waited. We waited a bit longer… until to everyone’s surprise there appeared a taxi, surrounded by white light, choir music and guided by arch angels. The only taxi on the island (who ripped us of on the spot of course, the beautiful results of a monopoly) brought us to our destination, which appeared to be one of the many treasures Ometepe has in store. This big, natural swimming pool is a major tourist magnet, for obvious reasons. The clear fresh water surrounded by jungle provided the tropical break we were looking for, and the monkeys swaying just above our heads just perfectly topped off the experience (while thoroughly ignoring the loud families throwing used diapers along the waterside). After some sweet-talking and seductive smiling we arranged a hitchhike back ‘home’, concluding the day in an exceptional way with a home-cooked meal devoured on our lush overgrown private patio. With a positive mindset we decided to give the first successful day without motorbike a sequel at the San Ramon Waterfall. We woke up early to catch the bus… that broke down. 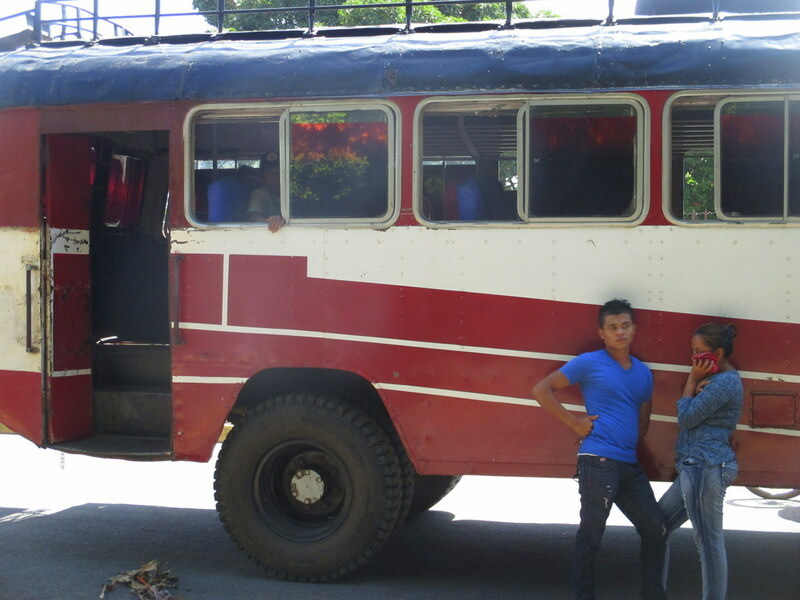 So we waited two hours in the sweltering heat to grab the next bus, ANY bus. Heading to Santo Domingo we concluded we might arrange some transport from there to reach San Ramon after all. This was possible. If you’re willing to pay $50. Ok, maybe just check out the petroglifos and the beach in Santo Domingo then? 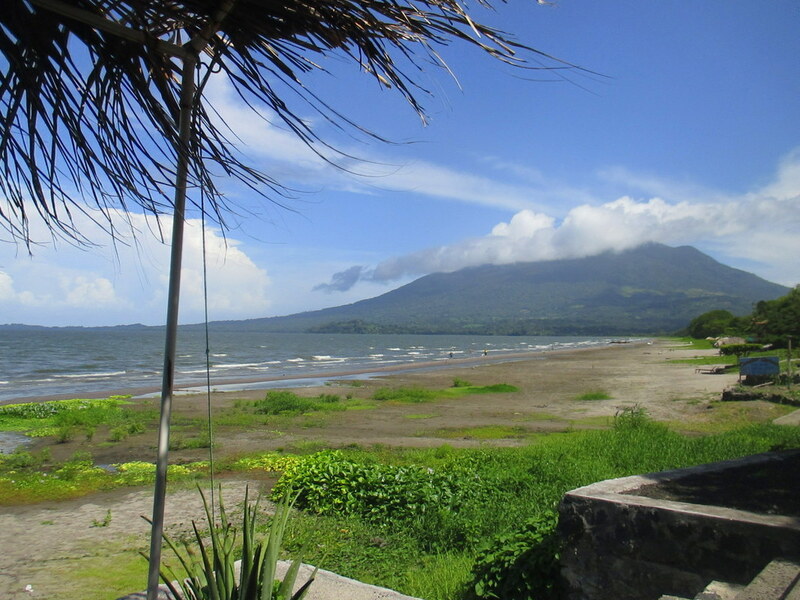 Good idea, the ancient hieroglyphs give an interesting perspective on the island’s and nation’s history and although the beach is black and less idyllic than it might sound, the views on Volcán Madera you have while being cradled by the Cocibolca waves are stunning. But then… yes then you have to get out of the place, which is an interesting operation if the bus schedules hanging around are just for show. Every hour there should be one coming all we saw was some dust blowing passed in the wind. Why built such attractive roads of they are legendarily unused. Just when I saw a panic outbreak on the way while glancing in my mother’s eyes… the last possible bus arrived with loud honking and screaming from the man whose job it was to scream. And that’s how life works too, kind of. Appointments don’t have to be met in time if they are not made in the first place. Stress can easily be replaced by acceptance. Not by my mother though. She wanted to go, as stress not only evolves from too many things to do or to choose from, but also from the inability to do anything at all. We took the bus to the ferry, which went on time. While I saw the driver throw his garbage out of the bus right in front the sticker “hacia un Ometepe verde & responsable”, I decided to come back. Later. One day in my life, when the era of incapability that’s paired with the fragile fresh steps in the herald of tourism has made place for something more solid. Yes, we might be touristic ‘pioneers’ here for what it’s worth, but this time I was longing for that touristic infrastructure and development I usually try to avoid. The equilibrium is sensitive. 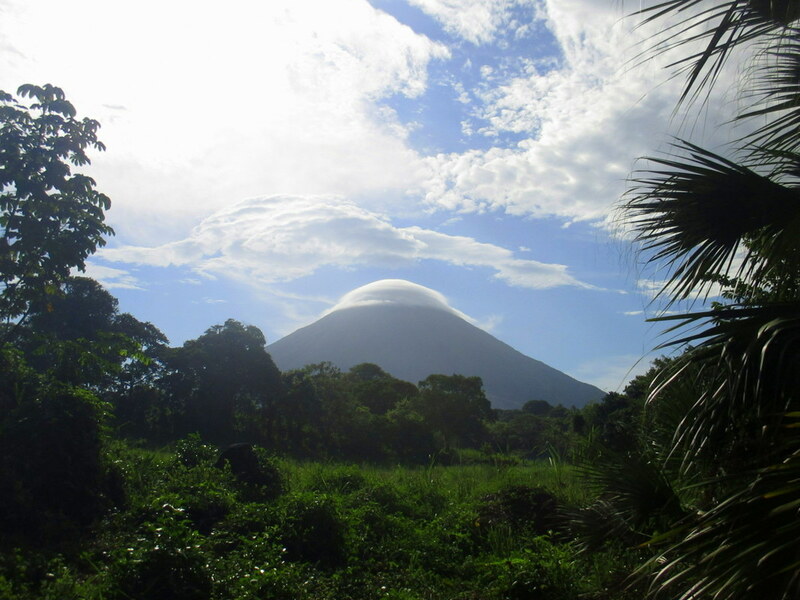 ​- El Salvador's volcanoes, right in the city!